Rhythm activities for kids start from something as simple as clapping. This video shows an ultrasound of an unborn baby clapping as the parents sing! While the actions of the soon-to-be baby are astonishing, rhythm is no surprise. It’s very definitely part of our lives. Breathing and heartbeat are two constant rhythms from the very beginning to the very end of life and in between there’s the rhythm of walking, running, language, music, and more. Our world has the rhythm of day-night and seasons with variations on a theme. Is it any wonder that much of our art work and art play has rhythm? Besides clapping, rhythm activities for kids can include dancing, marching around, jumping, hopping, and other actions either with or without music. 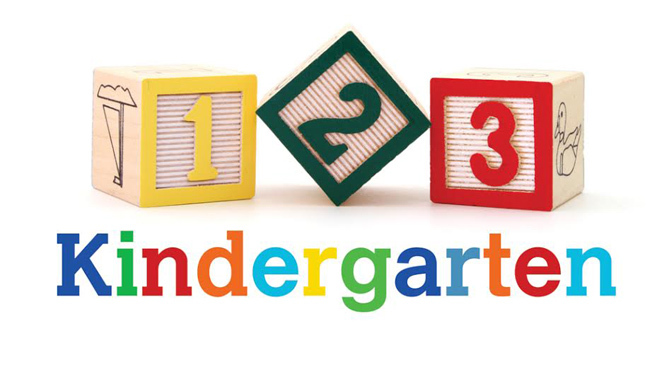 Kids can hit two rocks, sticks, or blocks together. Homemade maracas can be assembled with some small objects in a tin, plastic bottle or egg, or other container. Look for durability when buying. Rhythms can be fast-slow, simple-complicated, and loud-soft and make different patterns. Kids can tap their own patterns and we can play some for them to copy. For older kids, it’s fun to play rhythm games. Have you seen videos and clips of clapping with cups? 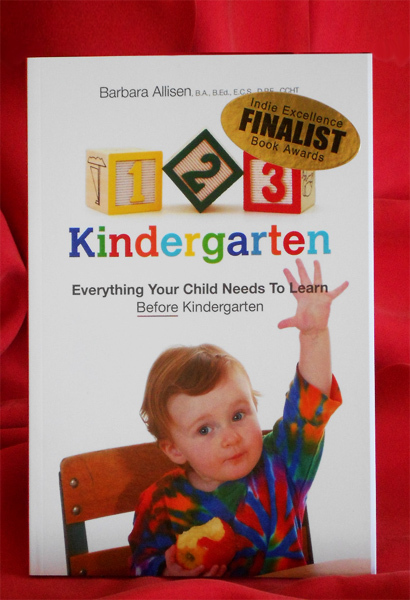 You can show some to your preschooler and see what kinds of patterns your child can do. Families can do some of these together and it’s not always the young ones that find it a challenge. Hands, feet, and other body parts can tap out different sounds. If you can, do some Hambone for your child or check out some Youtube Hambone videos. Some of the Hambone artists have very white hair! 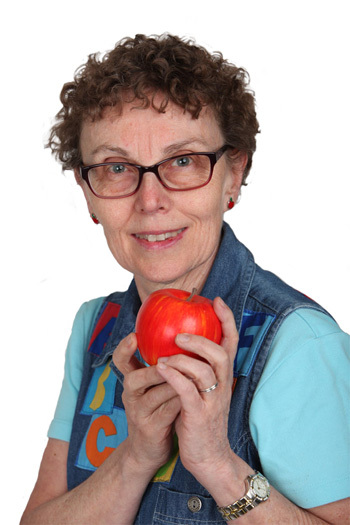 (Hambone is a sort of body-slapping, such as hitting the thighs, hands, chest, mouth, arms, etc to make a variety of sounds. Kids often do these kinds of actions. 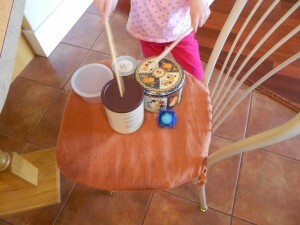 Rhythm activities for kids are another form of art work play. 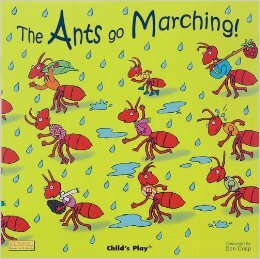 Can you include some rhythm fun for a play-of-the-day for your child? New Year’s Eve is coming with more holiday excitement! While noisemakers are traditional, did you know for kids they stimulate all kinds of brain connections? To welcome in the new year, kids can make their own. There are many different ideas for noise makers, but small objects such as beans and dried peas can be a concern and tend to fall out if all edges aren’t sealed. Here’s one that uses something much bigger, made from recycled items. To make this noise maker, use 2 aluminum pie plates the same size. 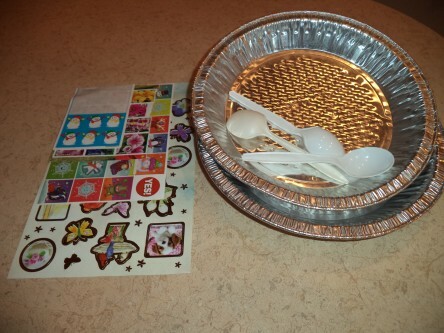 Put two or three plastic spoons in one of the pie plates, put the other on top, and staple or tape in a few spots. 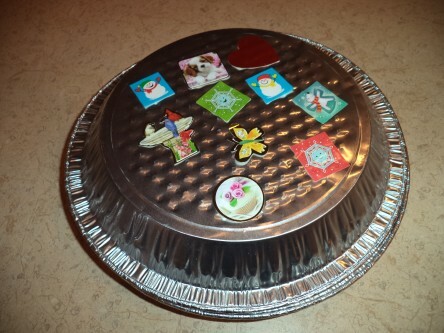 Kids can decorate the pie plate with stickers, ribbon streamers, or markers. 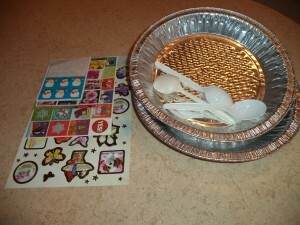 Surprisingly, plastic spoons inside 2 pie plates make lots of noise! Kids usually don’t need encouragement to make noise and they do it with their voices, bodies, and whatever they can find. As kids explore and play with noise, they are also discovering rhythm. 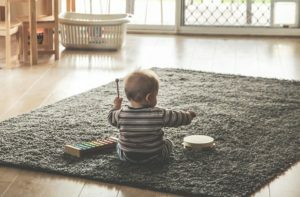 Rhythmic activities are important for brain development and create brain pathways and connections used to learn language. 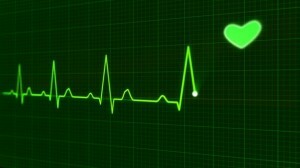 Rhythm is part of life; just think of breathing and heartbeats. Many of our activities, such as walking and running, are rhythmic. 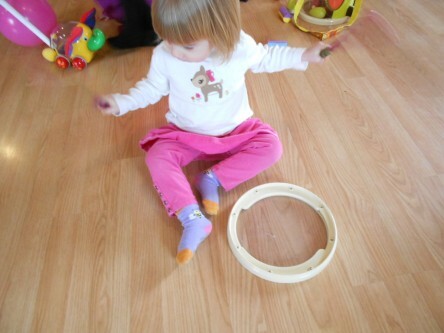 As kids create noise and rhythm, they discover loud and soft, fast and slow, and other basic concepts. 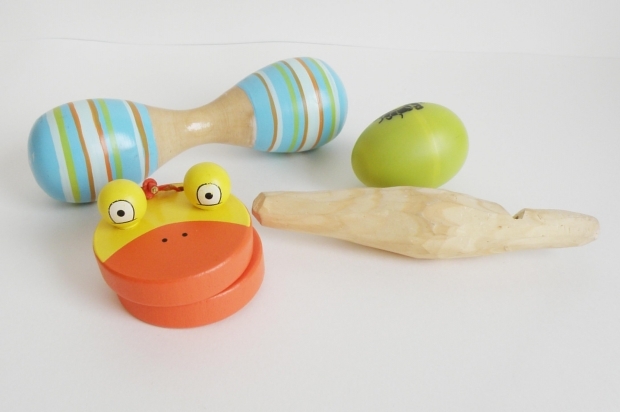 If you and your child each have a noisemaker, you can play a simple rhythm and let your child try and copy it. This encourages careful listening and memory. Or, you can clap a pattern, and your child can echo it with the noisemaker. Your child can have a turn and make one for you to tap or clap. Now, it’s your turn to listen and play back. 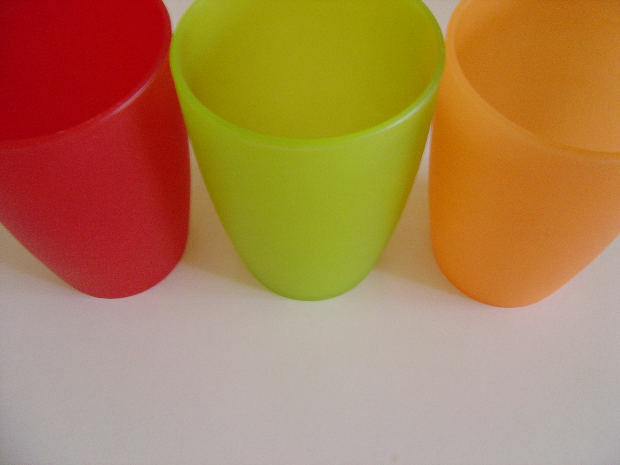 A simple noisemaker can be part of both fun and learning. Isn’t that something to celebrate?